Forty-four players, including fourteen from the Wellington region, are taking part in the National senior Doubles at Herne Bay, Auckland, next weekend. The field is headed by defending champions Clive Bartleet and Bob Bridge, but also includes former champions Pete Hamilton (2011), Graeme Morris (2011), and Bill Peachey (2009, 2010). On the first day of the Regional Doubles a cochonnet was hit by a boule and broke into three pieces. In the actual game, the end was annulled. APSPC Umpire, John Degueldre has advised that: After the cochonet was broken the end should have been continued after replacing the largest part of the broken one by a new one of the same size. (A in the diagram). See Article 10a - Changing of jack or boule, part 2. The largest part is taken into consideration means that it is the largest part of the broken cochonet (or boule) that will be replaced by a new one. FIPJP have announced the first Men's Singles World Championship to be held in Nice, France (31 Jan-2 Feb 2014). Entry is limited to 32 countries and the Oceania Federation may send two representatives. It will be interesting to see if this is a forerunner of a move to limit entries to the World Championships (Men 48 teams, Women unlimited as the number is less than 48). The reserve player is Tony Simpson (Wanganui East) and the coach is Yvonne Futcher (Wanganui East). The eleventh Haines Cup match will be played at the Manawatu Pétanque club in Plamerston North an Saturday, 14 December. Denise Bavidge, Maurice Belz, Sharon Cannon, Dez Grant, Geoff Greer, Ian Hay, Simon Hurley, Robin Johnston, Murray Porter, Lee Taffard, Robert Wilson, Sarah-Jane Wright. 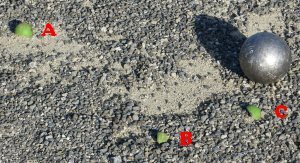 Eighteen teams have entered the WPA Open Triples to be held at the Horowhenua Pétanque club this Sunday (15 December). The start time is 8:00 for 8:30 am. Two more entries have been received for the Open Triples. Clive Bartleet and Bob Bridge successfully retained their National Senior Doubles title last weekend. 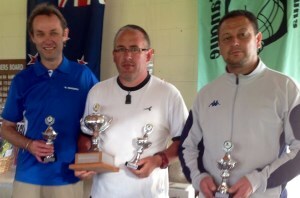 Twenty-two teams took part in the tournament at the Herne Bay Pétanque club in Auckland. Surprisingly, given the number of players in the North Island, this was less than the 31 teams that took part in last year's competition in Dunedin. In the Championship final, Clive and Bob narrowly beat Pete Hamilton and Richard Lawson 13-12. The Trophy Consolation was won by John Greig and Bill Peachey from Charles and Jean Parley. The format for Haines Cup was one round each of Singles and Doubles followed by two rounds of Triples. At the end of round 1 both sides were locked at 6 all, having shared the 12 games of Singles. Hawke's Bay took a comfortable lead in round 2 winning 5 out of the 6 games of Doubles. With 24 points still on offer, Wellington had to pull some tricks out of the bag, winning 6 out of the 8 games of Triples. The four games in round 3 were split 2-2. Wellington was not making things easy for themselves having to win all 4 games in the last round. Things did not go according to plan as Hawke's Bay won 3 games in the last round to comfortably win the Haines Cup for the third year in a row. Myles Cowper, Nick Jegousse, and Michael Rocks went one better than last year to win the WPA Open Triples at the Horowhenua Pétanque club. In the Trophy final, they beat Yvonne Futcher, Barbara Johnston, and Annick Le Guen 13-8. The two-time defending champions, Sharon Cannon, Richard Turfrey and Lee Taffard, were beaten in the quarter-final by the runners-up. 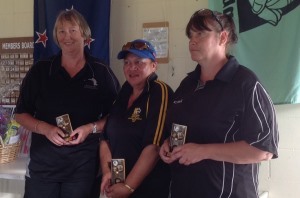 The Plate was won by Rangi Ankins, Rosemary Barrack, and Shirley Peard. The Bowl was won by Steve Frampton, Enoka Smiler, and Monica Smiler. The full Trans Tasman result courtesy of the Australian Pétanque Federation is now available. Fifteen WPA region players have entered the 2014 PNZ National Selection process. Bob Bridge (Masterton), Gordon Dykes (Windy Hills), Christian Fouquet (Herne Bay), Dez Grant (St George), Simon Hurley (Napier City), Andre Noel (Vikings), Bill Peachey (Hibiscus Coast), Mark Richardson (Christchurch), Richard Turfrey (Wanganui East), Georgio Vakauta (Vikings). Sharon Cannon (Wanganui East), Yvonne Futcher (Wanganui East), Annick Le Guen (Kapiti), Angela Maxted (Kennedy Park), Christine Strichen (Wanganui East), Claire Wilson (Masterton). Alain Coulomb (Hibiscus Coast), Keith Dixon (Christchurch), Neville Frost (Caversham), Pete Hamilton (Wanganui East), Bob McCarthy (Otaki), Graeme Morris (Masterton), Ray Pierce (Herne Bay). Claire Bradburn (Silverstream), Marilyn Bunce (Alexandra), Janet Goodin (Caversham), Shirley MacDonald (Horowhenua), Margaret Maher (Northcote), Margaret Mordecai (Otaki), Ros Morton, Shirley Selwyn (Wanganui East), Ann Shields (Epsom). Six men and six women are required in both the Open and Senior grades for the Trans Tasman and the teams will be announced after the selection camps: Open Men (1/2 February in Auckland), Open Women (8/9 February in Wellington), Senior Men and Women (15/16 February in Wellington). The Trans Tasman will be held in Rotorua. The announced date of 22/23 March is at least a month earlier than usual and clashes with the scheduled WPA Regional Triples. Results from the Tri-Star tournament in Dunedin last month.